Running your own business? Always make sure your clients are happy? Great. But if those clients aren’t making you happy, don’t respect you or pay you on time (or want to pay you in fish and chips!) then you don’t really have a business, you have a pretty miserable job. And many freelancers and small business owners are frustrated with cycles of feast to famine in their work, bemused by a multitude of potential tactics, or fed up with how they are treated by some clients. One business owner who understands their challenges – and knows what to do about them – is Vicky Fraser. She’s the author of Business for Superheroes and presenter of a popular podcast of the same name. 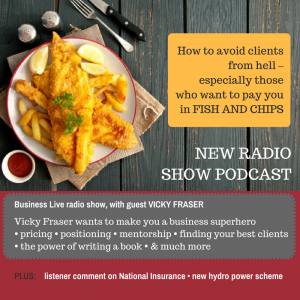 And Vicky gave business owners a feast of great ideas in an in-depth interview for my Sheffield Live Business Live radio show, broadcast on Friday 17th March. Listen to the podcast below. It’s crammed with advice based on solid experience. A must-listen for business owners, the interview covers dealing with clients from hell, the value in finding a mentor, positioning your business, pricing strategy (and why price is elastic), prioritising and much more. 47:14 – wrapping up, including preview of a mentoring event in Sheffield.